A lot of men are so hesitant to wear white jeans due to the fact that styling in incorrectly will make you look silly. But, that’s not right! White jeans are totally easy to wear and to match with. 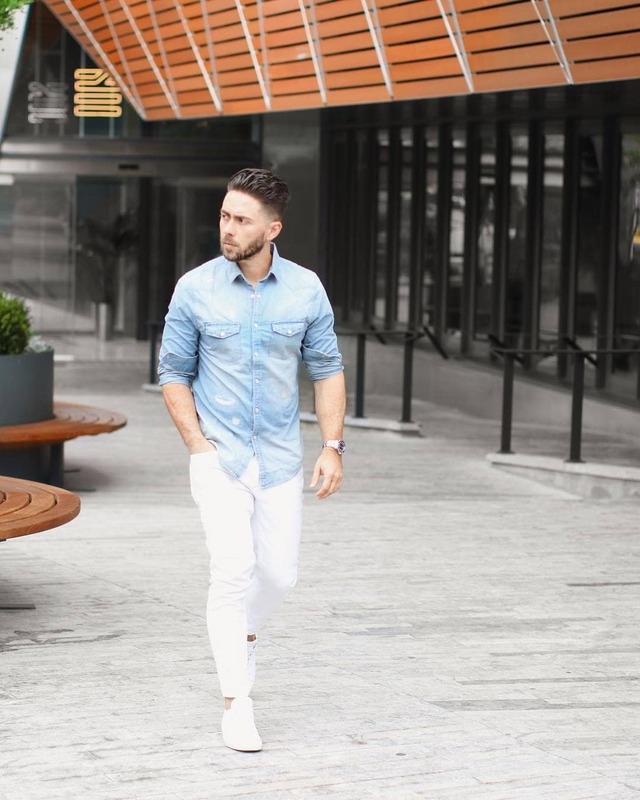 Owning some white denim could be the best decision you can make. The edgy vibe that it will give you would make you more attractive. You can pair these white jeans with blazer, shirts and down to the coats. Most importantly, try to wear your white jeans outfit with confidence.Carry and own your style, don’t let your outfit intimidate you. This guide will help you on how to properly style and what things to pair with your white jeans. Almost anything can be paired with white jeans but remember to keep it simple. Don’t take the attention away from it. Make your jeans the centerpiece of your outfit. Adding some hues to your own white denim jeans are bomb! Colored shirts, jackets and blazers will make you more attractive. Add some accessories too and you’re all set! White jeans are pretty simple yet it makes an impact as you wear it so show boldness when you are wearing it. Nothing can beat white jeans paired with a long sleeve shirt. This style can be both formal and casual. But, that’s not the only type of shirt you can pair. If you don’t feel like wearing long sleeves, obviously go for a short sleeve on or a simple T-shirt. Light color shirts can transform your get up into something different. Printed ones like Hawaiian shirt will give you a total summer vibe which is so pleasing to the eyes. You could also try experimenting the way you want to wear your shirt either tucked or not. Add a little extra effect by wearing accessories. White jeans paired with a blazer will give you a formal get-up. A plain blazer with dark colors are the ones that will complement your white jeans, however, you can always go for a colorful and patterned blazer if you feel so. Try to experiment with the color of the blazer you’re about to pair with your jeans. Color blocking will always be a good idea. If you don’t have an available blazer, a waistcoat would be a good swap. Just make sure that your waistcoat perfectly fits on you. Jackets will exceptionally go with your white pants. You have various kinds of jackets to choose from leather down to denim.The leather jacket is a must-have! It’s one of the most classic pieces of jacket that will give you a bold and distinct look. Pairing your white jeans with a leather jacket will make you look like a bad-boy with a great sense of fashion. White jeans and bomber jackets are perfect for an everyday outfit since both outfits are flexible and can be paired with almost anything. It doesn’t matter what type of bomber jacket you’ll use when wearing your white jeans just make sure to have a good pair of shoes to give you a dope look. The denim jacket and white jeans would be a good mix. Double denim look is excellent as long as the pieces don’t have the same shade. With your white jeans, choose a denim jacket which is dark in color. A Navy, blue or black one would be flawless. Sweaters in white jeans will give you that nice chilly atmosphere. You could always opt for the classic white and black sweaters but vibrant colors could do the work too. Finish this get up with the pair of your favorite trainers. Coats are also good for layering your white jeans combination outfit. Whether you’re opting for a casual or formal attire, coats are perfect to make you look good and warm at the same time. There are different coat colors available so try to get what you want, any color will give your jeans an attention anyways. Wear your loafers or brogue to complete your get up. When it comes to white jeans and shoe combination, there aren’t many options, unlike other pants that could be paired with any shoes. Make sure to have your shoes spotless when wearing white jeans. The whiteness of the jeans will make the dirt on your shoes so obvious that will affect the total look of your outfit. Below are the kinds of shoes that look superb for your white jeans. Wearing loafers complements your white jeans. Suede loafers are great for daytime getup and activities while the shiny loafers are best for night-time style. Try to play with the colors of your shoes, though brown, burgundy, and black are the most commonly used. Boots on white jeans? It’s not a bad idea, after all, it’s actually one cool combination. Pairing your white jeans with boots will give you a very cool look especially in winter. Try to wear brown or black boots to complement your jeans. Trainers can go with any pants so it means white jeans isn’t an issue. Try to wear any trainers you have. Play with the colors to match your jeans. This is a very casual outfit you could wear any time of the day. Comfy yet very stylish get up. Boat shoes and a pair of white jeans will give you that classy look. Black boat shoes are too mainstream so if you want to have the more appealing vibe and want to uplift your fashion you could wear brown or blue or any other colors depending on your preference. Brogue shoes are definitely for a more formal outfit. So if you’re planning to wear this with your white jeans try to wear some blazers with it. The color fo the shoes will make your jeans stand out and more appealing. Don’t be afraid to mix and match. Desert boots plus white jeans are the kind of outfit you’ll have if you’re the lively type of guy. These shoes go with any seasons and will make you feel cozy. This mixture of pants and shoes will provide you an outstanding and eye catchy look.